TTB’s attempt to put an end to an inherently misleading labeling practice and protect the AVA wine origin labeling rules has garnered significant reaction from certain commentators and some in the industry. In order to shed some light on the proposed amendments to federal labeling rules and why Napa Valley Vintners, the Wine Institute, over 50 members of Congress and others have supported TTB’s Notice of Proposed Rulemaking 160, we have prepared the following summary. I. Current regulations allow certain wineries to employ misleading labeling practices. Producers selling wine in interstate commerce must obtain a Certificate of Label Approval (“COLA”) and comply with federal regulations aimed at protecting consumers from misleading labeling practices. This includes federal standards for using vintage date, grape variety designations, and wine origin designations such as county, state, and country appellations and American Viticultural Areas (“AVAs”). Wineries wishing to avoid enforcement of these federal truth-in-labeling standards can do so simply by filing for a COLA exemption and noting on the wine bottle that the wine is “For Sale Only” in the state in which the producing winery is located. This leads to the potential for misleading wine labeling practices. For example, federal regulations require that an AVA wine sold in interstate commerce with a 2015 vintage date must be made from at least 95% grapes grown in that vintage. But those regulations do not apply, and therefore would not prevent, a wine with a certificate of label approval exemption from using a lower percentage of 2015 harvested grapes and still being labeled as “2015.” Wines with certificates of label approval can be labeled with a varietal name, such as Pinot Noir, if it is made from at least 75% of grapes of that variety, but get an exemption and slap on a “For Sale Only” sticker, and then there is no obligation under federal regulations that the wine meet that 75% requirement. Certain wineries have taken advantage of this COLA exemption loophole to designate their wine with an AVA while not complying with federal standards governing wine origin labeling, specifically, 27 C.F.R. Sec. 4.25 which requires that wine labeled with an AVA (a) be derived 85 percent or more from grapes grown within the boundaries of that AVA, and (b) be fully finished within the state in which the AVA is located. This “fully finished” federal requirement ensures that California wine production and labeling laws apply to wines that are identified with a California appellation or AVA. These federal appellation labeling rules assure consumers that when they buy an appellation-designated wine, they are buying a product wherein both the grape source and the place of production are closely tied to the named place. Absent such rules, retail shelves could be stocked with wine labeled as “Burgundy” that was made in Sweden, “Barolo” that was actually produced in Slovenia, or “Sonoma Coast” made in Alaska. II. TTB’s Notice 160 Proposes to Close the Loophole By Requiring All Wines to Follow the Same Vintage, Variety, and Appellation Labeling Standards. On June 22, 2016, the U.S. Department of Treasury’s Alcohol and Tobacco Tax and Trade Bureau (TTB) responded by issuing Notice of Proposed Rulemaking 160, in which the agency proposed eliminating the COLA-exemption loophole by requiring COLA-exempt wines to comply with federal standards for vintage, varietal, and wine origin designations and to keep records to support such labeling claims. TTB subsequently granted a 90-day extension on September 8, 2016 and, in so doing, requested “comments regarding whether any geographic reference to the source of the grapes used in the wine could be included on a wine label in a way that would not be misleading with regard to the source of the wine” (emphasis added). III. NVV and Wine Institute Support Notice 160 to Put an End to Misleading Labeling Practices. NVV also pointed out that out-of-state wineries passing off their products as California wines by using the names of California appellations on their wine labels were able to avoid compliance with state laws regarding wine production and labeling. For example, wines produced outside of California but labeled with the name of a California AVA have no obligation to follow the state’s conjunctive labeling, wine composition and production, or misleading brand name statutes. Similarly, wines produced outside of Oregon but using the name of an Oregon AVA, would have no requirement to follow the much stricter Oregon varietal composition (requiring at least 90% for most varieties) and appellation of origin (requiring 100% from Oregon and 95% for all other appellations). As David Adelsheim, founder of Oregon’s Adelsheim Vineyard, pointed out in his support of Notice 160, “the reputation of Oregon’s AVAs, hard won through years of experimentation and work” would suffer as a result of allowing COLA exempt wines to avoid enforcement of state wine-related laws. After significant consultation, Napa Valley Vintners (NVV) and Wine Institute, a public policy advocacy association representing over a thousand California wineries and affiliated businesses responsible for 85 percent of the nation’s wine production and more than 90 percent of U.S. wine exports, issued a joint letter in further support of Notice 160, noting that the proposed amendments “put an end to the inherently misleading practice of using a Certificate of Label Approval … exemption to avoid compliance with federal labeling laws.” Sonoma County Vintners also issued a letter in full support of the NVV and Wine Institute position. IV. NVV and Wine Institute Put Forward a Proposal that Allows For Optional Grape Source Information for COLA Exempt Wines. In their joint letter, NVV and Wine Institute directly respond to TTB’s request for information as to whether grape source information could be included on COLA-exempt wines in a manner that was not misleading as to wine origin designations. The joint proposal directly addresses concerns that Notice 160 would prevent producers from providing consumers with truthful information regarding where the grapes used to make the wine came from, and at the same time protects AVA names as designators of wine origin. It also addresses concerns raised by wineries that had previously used COLA exemptions suggesting that they could continue to label their wine with truthful vintage and variety designations.. The NVV / Wine Institute proposal permits wineries to provide the following “Grape Source Information” on their wine: (a) the name of the county(-ies) and state(s), or just the state(s), where all of the grapes are grown; (b) the percentage of the wine derived from grapes grown in each county or state shown on the label; and (c) the city and state, or just the state, where the wine was fully finished. In order to avoid any confusion with wine origin designations, no name of an AVA (other than a county or a state) could be used as part of the Grape Source Information, and the wine itself would have to be designated using the “American” appellation. By using the American Appellation, (under current Federal regulations), the wine could also be designated with the vintage and grape varietal. In short, NVV and Wine Institute are in favor of truthful labeling practices that protect the integrity of the AVA system. The goal of the joint proposal is simple: when consumers come across a wine labeled with an AVA name, they should be assured that the wine actually meets the legal standards for AVA labeling. V. Support for Notice 160 comes from Industry Members That Believe Protecting Wine Origin Labeling is both Pro-Consumer, Pro-Grower, and Pro-Vintner. Notice 160 is supported by a broad swath of industry members that believe the integrity of wine origin labeling regulations is essential to the U.S. wine industry. Regional associations (including the New York Wine Industry Association and Washington Wine Institute) and industry members from well-established as well as up-and-coming wine growing regions have written to TTB to note their support for the proposed amendments. It is vitally important to grape growers that the integrity of the AVA system be maintained, and I applaud TTB’s efforts in ensuring that all wine labeled with the name of an AVA meet the well-established federal wine labeling requirements. Grape growers, whether they farm vineyards in well established AVAs or in newer AVAs, benefit greatly from regulatory efforts to protect those place names. Notice 160 has caught the attention of industry members since it was first issued back in June, over 170 days ago, as more than 100 comments have been submitted to TTB on this matter. TTB will consider those comments as it comes to a decision on whether: (a) the COLA exemption loophole should continue to exist; and, (b) additional and truthful grape source information can be included on such wines in a way that does not undermine the AVA system for wine origin designation. Wine industry members and consumers who believe that wine is a product of place and that place names are worthy of protection should support Notice 160. Although certain individuals may benefit financially from the COLA-exemption loophole, that is no reason for the federal government to allow an inherently misleading labeling practice to continue unabated. Moreover, elimination of the COLA-exemption loophole does not necessarily prohibit wineries from providing additional truthful, non-misleading information about grape sourcing. Any regulation that allows for such information, however, must also be crafted in a manner that maintains the integrity of the AVA regulatory system. The joint NVV / Wine Institute proposal does just that. Furthermore, if the U.S. allows U.S. wineries to skirt the rules for proper use of American appellations and American Viticultural Areas, then the U.S. will be in no position to insist that other countries require that their wineries also follow the rules in respect of American appellations and American Viticultural Areas. Undoubtedly wine production is less costly in countries outside the U.S., and if wine grapes from Napa Valley can be shipped to Texas and the wine produced in Texas is allowed to use the “Napa Valley” AVA on the label, there is no basis to object to a Chinese or Canadian winery producing a “Napa Valley” wine from Napa Valley grapes shipped to those countries. Not only is that bad for the U.S. industry, but it diminishes the value of the AVA and harms all consumers. NOTE – DP&F serves as outside counsel to several regional wine trade associations including Napa Valley Vintners with interests in protecting the integrity of regional appellations. As we’ve previously reported, the Internet Corporation for Assigned Names and Numbers (ICANN) has been selling hundreds of generic top-level domains (gTLDs) to domain name registries for $185,000 each. These registries then authorize domain name registrars to sell domain names to the public under the gTLDs that the registries have purchased. The registry called Donuts has purchased many of these gTLDs, including two of particular interest to members of the wine industry — <.wine> and <.vin>. The <.wine> and <.vin> gTLDs have been in limbo since they were awarded to Donuts due to issues raised by the EU and several regional wine associations concerning the protection of appellations of origin within the <.wine> and <.vin> gTLDs. However, those issues have since been resolved and the <.wine> and <.vin> gTLDs are now moving forward. This means that trademark owners that wish to secure domain names encompassing their trademarks under the <.wine> and <.vin> gTLDs must now do so within the sunrise periods that have been established by Donuts for the <.wine> and <.vin> gTLDs. If they fail to secure their domain names within the sunrise periods, those domain names under the <.wine> and <.vin> gTLDs can then be purchased by members of the general public and the only recourse available to the trademark owners will be through costly dispute resolution procedures. The Sunrise periods for the <.wine> and <.vin> gTLDs open on November 17, 2015 and close on January 16, 2016. In order for a trademark owner to obtain its trademarks within domain names for the <.wine> and <.vin> gTLDs, the trademark owner must first register its trademarks with the Trademark Clearinghouse. We have previously blogged about the process for registering a trademark in the Trademark Clearinghouse here. Once a trademark owner has obtained registration in the Trademark Clearinghouse, it may then pay to register its trademarks as domain names under the <.wine> and/or <.vin> gTLDs with recognized domain name registrars during the November 17, 2015 – January 16, 2016 sunrise periods. So, for all of you wineries wishing to take part in the new <.wine> and <.vin> gTLDs, now is the time to make sure that your trademarks are registered with the Trademark Clearinghouse. For additional information or any other questions contact Scott Gerien at his email. For decades, China has been criticized for shielding “trademark hijackers” – individuals or entities who have registered well known U.S. marks in China despite having no affiliation with that brand. If a winery failed to apply for their trademark in China often it was not too long thereafter that the brand would be registered in China without knowledge or permission from the brand owner. While this practice continues to this day, the new Chinese Trademark Law (adopted on August 30, 2013 and entering into effect on May 1, 2014) will emphasize the principal of good faith to aid in the crack down against trademark hijacking and will impact trademark matters in China occurring from May 1, 2014 forward. The new law states that trademarks shall be registered and used in accordance with the principal of good faith. An injured party can use the good faith principle to challenge a trademark hijacker’s Chinese trademark registration during an opposition or invalidation proceeding even if the injured party does not hold an identical or similar trademark registered in China covering identical or related goods or services. The new law also increases the penalty cap for trademark infringements to RMB 3 million (around $491,892 U.S. Dollars). Despite these amendments, it may likely remain difficult and frequently impracticable for western entities to quash bad-faith filings of their trademarks if their brands are not registered in China. The new law provides for specific measures to discourage bad-faith filings under certain circumstances. On the one hand, distributors and manufacturers are advised to refrain from applying for a trademark identical or similar to a trademark which has been used earlier (but not yet registered) by their partners, with respect to identical goods or services. “Partnership” is interpreted in a broad way to include contractual relationships, business relationships and other relationships. As an added boon, the amendments prohibit a trademark agent in China to handle a trademark application if it knows or should know that the client’s application is an attempt to usurp or hijack another person’s trademark or is made with intent to preemptively register, in an unfair manner, a trademark that is already in use (but not registered) by another person who enjoys a certain reputation. Moreover, trademark agencies are prohibited from registering trademarks in their own names for other services outside IP services. Even with the new law, the best defense is a good offense–register your brands in China. Like the United States, China is a contracting member to the Madrid Protocol. Under the Madrid Protocol, U.S. trademark counsel can apply for a trademark in China based on a client’s U.S. trademark application or registration. Utilizing the Madrid Protocol may remain the most effective strategy for protecting your brands in China. Considering that the world has more than 7 billion inhabitants of which the majority or 1,317,471,458 billion of them reside in China, (in comparison, the U.S. population is estimated to contain 317,471,460 inhabitants), with such a large potential market, it makes sense to register your brand in China. Doing so is cost effective especially in light of the frequent hijacking of wine brands. If you are planning to sell in China in the near future or would be upset to learn that your brand has already been registered in China, albeit to someone else, the most cost effective strategy to prevent such abuse is to register your brand in China. The initial outlay in registering a brand in China pales in comparison the costs associated with losing your brand to a hijacker or marshaling resources to get the brand back. Part I of the “Exporting Wine to China Seminar” was published on LexVini on October 17, 2013. In Fall 2013, DP&F’s Katja Loeffelholz was a guest lecturer at Cal Poly San Luis Obispo’s new Wine and Viticulture program on “Protecting Your Intellectual Property Assets in the Wine Industry” which reviewed the various aspects of wine labels and packaging that can be trademarked, copyrighted and patented. Ms. Loeffelholz also presented detailed information on protecting trademarks abroad, focusing on protecting wine brands in China. Her presentation can be found through the links below. The annual meeting of the International Wine Law Association wrapped up today in Vienna, Austria. The two day meeting featured speakers from Europe, South America, North America and Australia. Topics covered included wine law developments in up and coming wine markets, geographical indications, advertising restrictions for wine, use of expert testimony in litigation, how government regulators can assist wineries and alternative dispute resolution. DP&F’s Scott Gerien presented on the Alternative Dispute Resolution program of the US District Court for the Northern District of California. 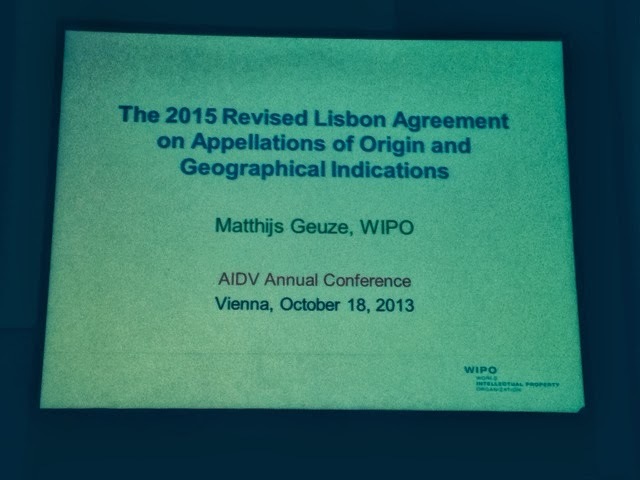 For more information on the conference or to learn more about the International Wine Law Association go to www.aidv.org. China represents the single largest growth opportunity for wine producing countries around the world. China is a brand driven market. So what are the challenges in protecting intellectual property in China? One of the principal difficulties of protecting intellectual property in China is the failure of U.S. wine brand owners to register their trademarks in China. Sometimes the failure to register stems from the mistaken belief that a U.S. registration protects them abroad, or the belief that registration in China is expensive and time consuming. For others still, business or wine exports may be expanding so rapidly that they unintentionally expose to themselves to risk by postponing registration. China’s Standing Committee of the National People’s Congress has passed new trademark law provisions that should improve a trademark owner’s ability to enforce their rights and deter infringers. The new law provides for an increase in statutory damages. Where the infringer is believed to have acted in bad faith, the courts may also award treble damages. These revisions to the law will serve as a deterrent to infringers while signaling to the rest of the world that China will not tolerate a violation of trademark rights. However, a U.S. wine brand owner will be unable to take full advantage of the provisions of the new China trademark law unless and until it registers its mark in China. There are essentially two ways for a U.S. company to obtain trademark registration in China. The first is to have its trademark counsel file the trademark application directly in China working with foreign counsel. The second is to use its U.S. trademark registration as a basis for submitting an International Registration with the United States Patent and Trademark Office. It should be noted that a trademark registration in the People’s Republic of China will not provide trademark protection in Hong Kong or Macau. Separate applications will need to be made. On July 24, 2012, Wine Institute held its California Wine Export Seminar at The City Club in San Francisco. The highlight of the Seminar was a special panel presentation on the Chinese wine market featuring Maria Troen from Wine Intelligence, ZJ Tang from Chicago Chinese Cultural Institute, Pete Hou, Wine Institute’s trade representative in China, and Scott Gerien from Dickenson, Peatman & Fogarty. The panel presented on market issues, cultural issues, trade issues and legal issues related to selling California wine in China. To review the full PowerPoint presentation by Scott Gerien on legal issues related to protecting wine brands in China, click HERE. For more information on protecting your wine brand in China contact Scott Gerien at sgerien@dpf-law.com. Is Your Brand Safe in Asia? China is the new darling of luxury good exports, including wine. However, many wineries fail to fully consider the need to protect their trademark in China prior to doing business there. Not only is counterfeiting a problem in China, but so is trademark squatting where Chinese nationals pre-emptively register foreign company trademarks. Scott Gerien, the head of DP&F’s intellectual property practice, discusses these issues in his column in the January 2012 issue of NorthBay biz which may be accessed HERE. For wineries with contracts with importers or distributors in the U.K., this is important because ending such a contract based on perceived non-performance and repudiation can be a risky proposition. DP&F maintains a network of wine law colleagues throughout the world. Contact us for assistance on any matters of international wine law.